A perpetual inventory system that keeps information on an unlimited number of products is simple with the Inventory Management module. Scale purchases and sales shipment automatically update inventory records during daily processing. Each inventory item record includes quantities for work in process(WIP) and ready to ship(RTS). The input screen in inventory allows for entry of adjustments resulting from processing. 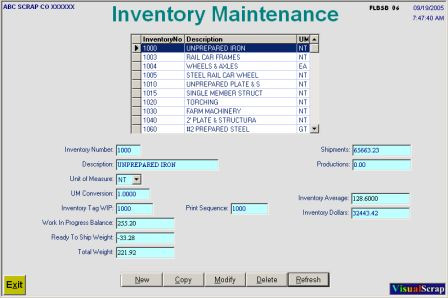 Inquiry of inventory products can be displayed on the screen or printed at anytime. These reports include total weight, WIP weight, RTS weight and units, the average price, production weight and weight shipped.